6600 yard Gordon Lewis-designed 18-hole golf course, rebuilt in 2015. Naples Heritage is a Naples Florida bundled golf community set on 550 acres, over 300 acres are preserves and lakes. There are 799 homes clustered in neighborhoods. Naples Heritage has two types of condominiums with a variety of floor plans, golf villas with two-car garages and lanais. Single-family homes offer a range of square-foot options. All owners join a neighborhood association which handles a variety of maintenance services, depending on the neighborhood. Playing just over 6,600 yards from the tips, the golf course was designed by Gordon Lewis and opened in 1997. To accommodate players of all ages and skill levels the course features eight sets of tees. The course was rebuilt in 2015 using Celebration Grass on the fairways and tees, and Tif-eagle on the greens. Golf membership is bundled with the purchase of real estate there are no initiation fees. Members pay cart fees but no additional greens fees and walkers are allowed after 4 pm daily. Tee times are managed through an electronic system which distributes available times on an equitable basis. The system may be accessed online. 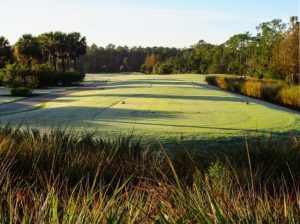 Members also enjoy reciprocal golf privileges at more than 50 golf clubs in Southwest Florida from May through October. The 15,000 sqft clubhouse at Naples Heritage offers the main dining room, the grill room, and bar. All surround an outdoor patio and overlook the 9th and 18th greens with seats available at an above-ground fire pit. Lunch is served seven days during the season and six days a week in the summer. Dinner is served seven days weekly in season and on a more limited schedule during the summer months. There’s a modest restaurant minimum which is generally no problem because as there are many social events throughout the year. Naples Heritage features several tennis courts. The four courts near the Clubhouse are Har-Tru. Other courts are available in the neighborhoods and include six new Pickleball courts. All are available to the membership without charge. An active Tennis Association organizes tennis leagues, clinics, lessons and other events during the season. For additional information about Naples Heritage Naples FL, please complete the form below! I or one of my team members will respond to you within one business day.